Ascoli Piceno (to distinguish it from another Ascoli in Apulia) was not paid much attention by Grand Tour travellers, notwithstanding its medieval and Renaissance monuments and its picturesque location. 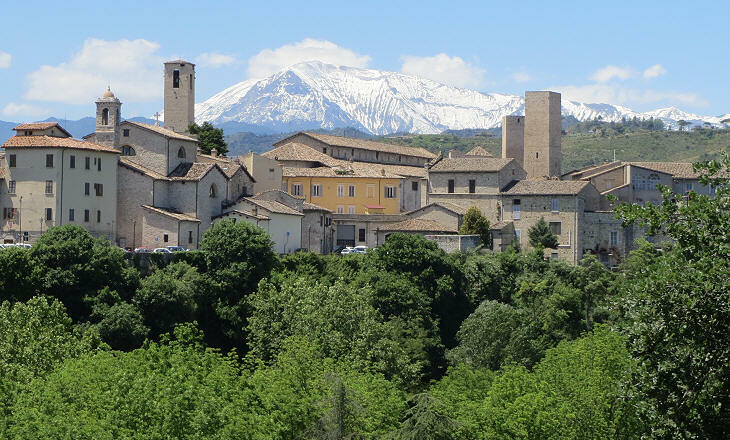 A range of high mountains reaching its peak at Mount Vettore (2,476 m/8,123 ft) separates the town and the Tronto valley from Norcia and Valnerina. The Romans built a road to strengthen their control over the Piceni, the Italic tribe who lived on the northern Adriatic coast of the peninsula. It was known as Via Salaria. It was a very daring enterprise as the road followed the deep and long ravines made by the Velino and Tronto rivers. A major advantage of this choice was that Via Salaria crossed the water divide between the Tyrrhenian and Adriatic seas at a rather low height (1,010 m/2,829 ft), so that it was passable during most of the year. 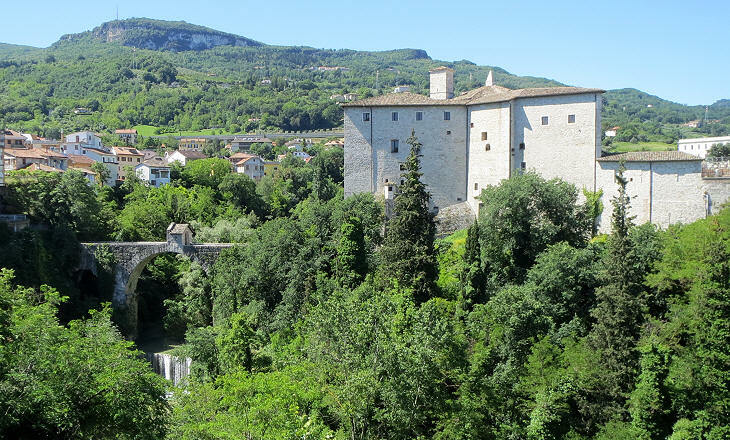 Via Salaria entered Ascoli at its western end where it was not protected by ravines. A high bridge on the Tronto is evidence of the skills of Roman engineers. 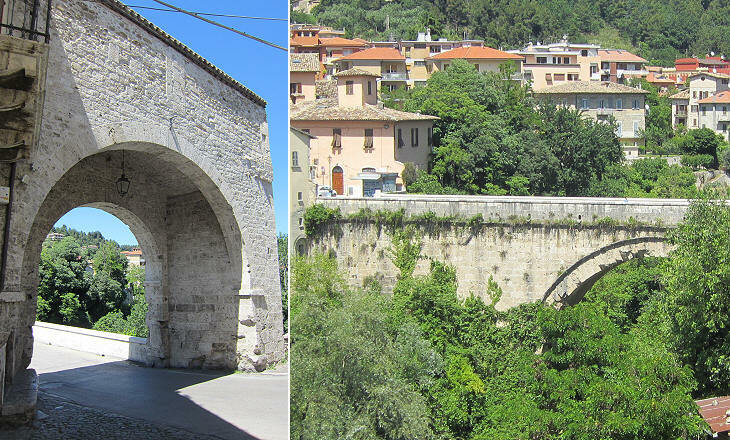 They could have built a much smaller bridge at the level of the river bank, as they had done at an earlier time with Ponte di Cecco (from which Via Salaria exited Ascoli), but the high bridge was meant to show the wealth of the town and to provide an easy communication with an urban settlement on the other bank of the Tronto. Solestà derives from solum extra urbem (out of town land). 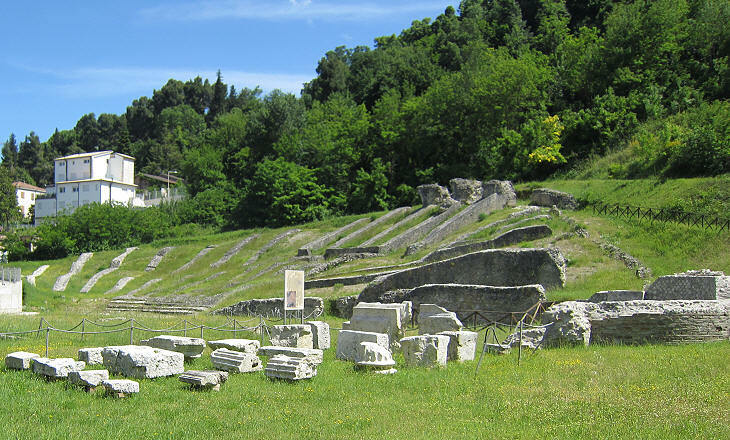 The inhabitants of ancient Asculum had a theatre which has been excavated after WWII. It was built at the foot of a hill which is inside the town enclosure. According to tradition in 91 BC Roman magistrates were killed at the theatre during a performance; it was the signal of a general rebellion against Rome. 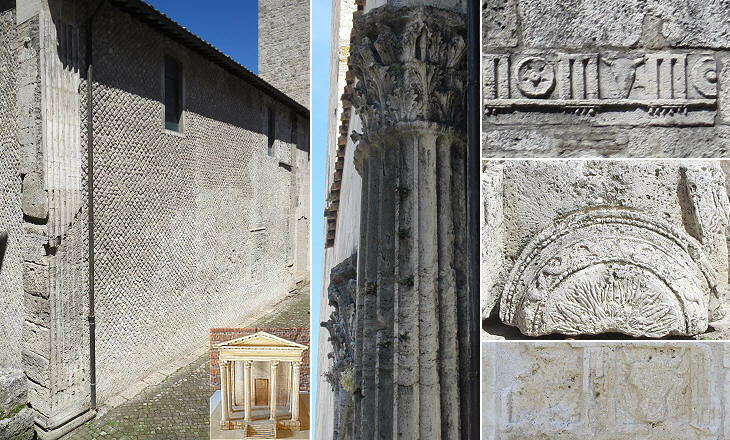 S. Gregorio is a small XIIth century church built utilizing the cell and some columns of a Roman temple. 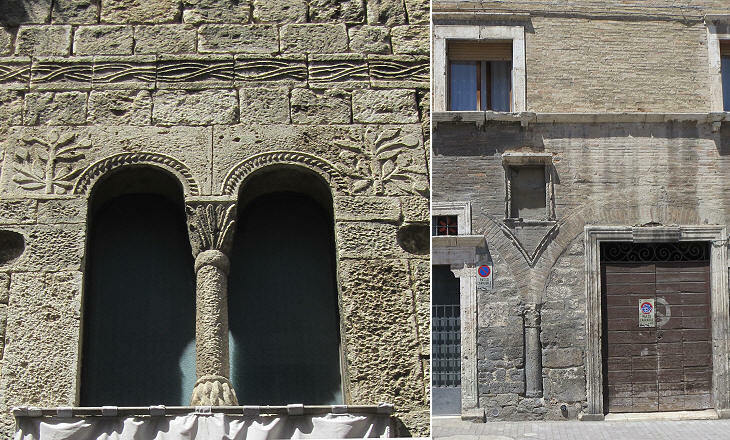 Roman reliefs can be seen on the walls of many medieval buildings. In 578 AD the inhabitants of Ascoli, relying on their fortifications, did not surrender to the Longobards who, when they seized the town, razed it to the ground. Ascoli was annexed to the Duchy of Spoleto, detaching it from the lower Tronto valley which remained in Byzantine hands for some time. The urban layout of Ascoli is based on that of the ancient town with two main roads dividing it into four quarters. The historical quarter of S. Giacomo which is situated in the north-western part of Ascoli between Porta Romana and Porta di Solestà, retains its medieval character. 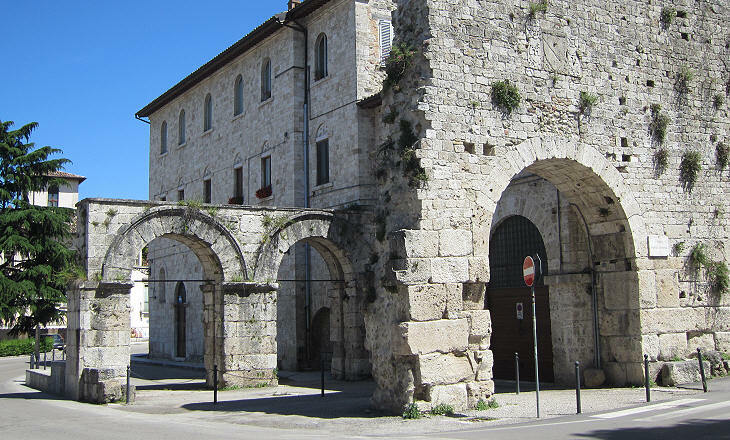 Notwithstanding its name, Palazzetto Longobardo was built in the XIIth century when Ascoli was a flourishing Comune (city state) within the frame of the Papal State. Ascoli is located just a few miles north of Abruzzo, a region of Italy where a particular type of Romanesque architecture developed in the XIIth-XIVth centuries. 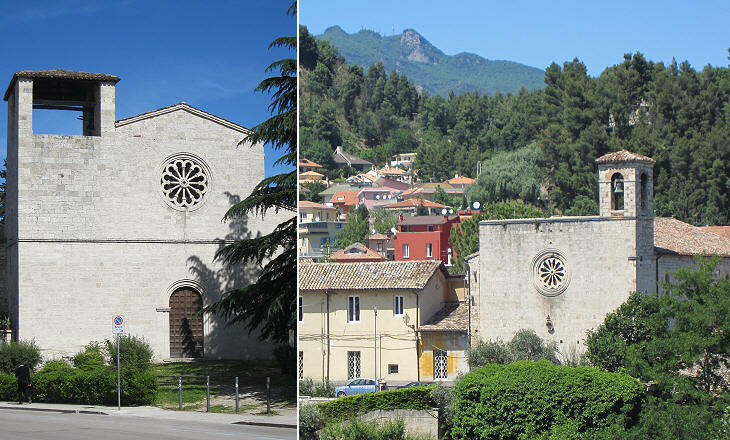 S. Maria di Collemaggio at L'Aquila (it opens in another window) is the most impressive church of this style. 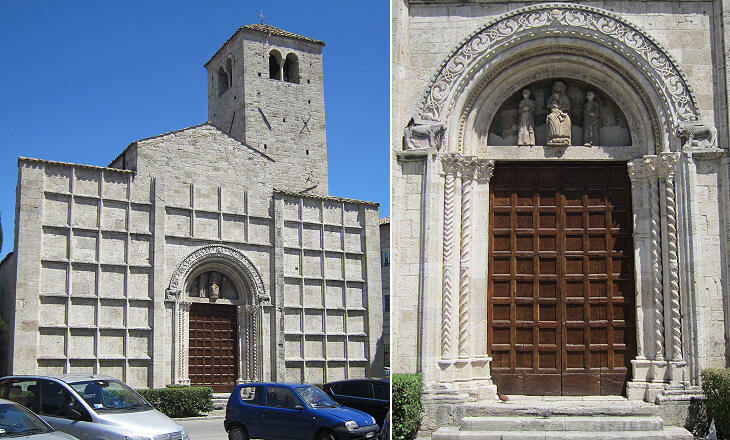 Its influence can be observed in the design of some minor medieval churches of Ascoli. Some of them, such as S. Vittore, were freed from later additions in the XXth century. S. Giacomo gave its name to a quarter of Ascoli. Although being a rather small building the church has three portals one of which comes from an older church. 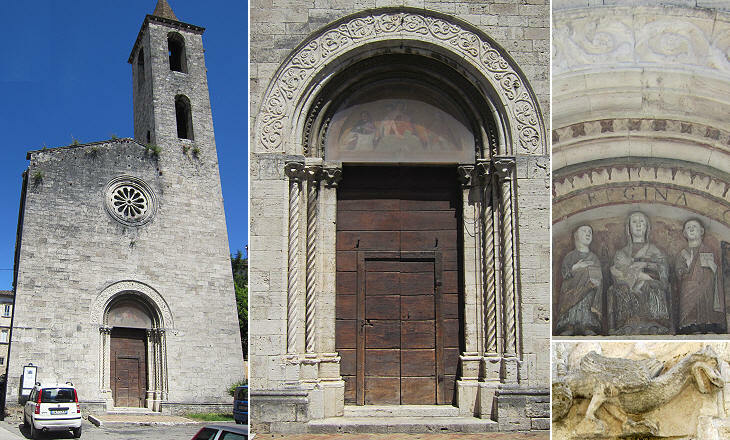 A feature of S. Giacomo and in general of Ascoli is the use of travertine (from local quarries), a white/yellowish limestone which was employed in many Roman monuments. The façade of this old medieval church was redesigned in 1389. Its 64 square partitions housed frescoes depicting episodes of the Old and the New Testament, so that the church was known as the Bible of the Poor. 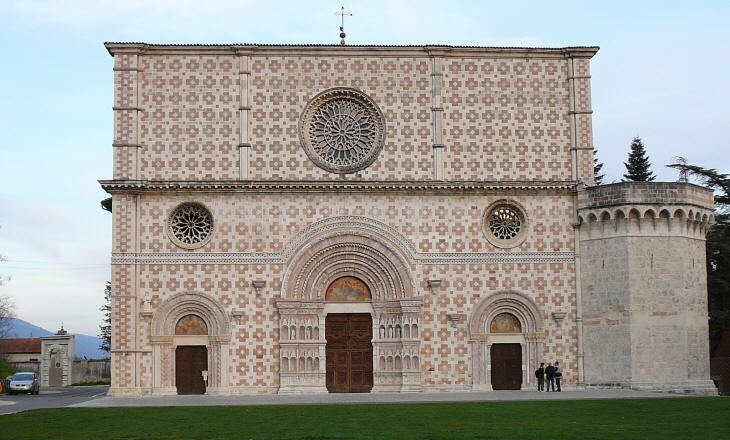 The design of the façade is rare, but not unique and it was inspired after that of S. Rufino, the Cathedral of Assisi. 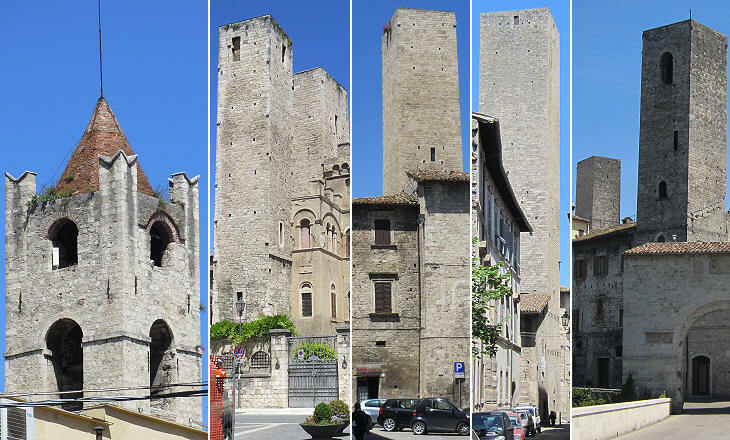 The height of the medieval towers of Ascoli show that the town, although being located next to highly seismic areas has not been hit by major earthquakes. St. Emidio, the patron saint of Ascoli, is known for protecting against earthquakes. In the early XVIIIth century, after an earthquake struck the region, but spared Ascoli in 1703, the inhabitants of the town dedicated to him a very special church. 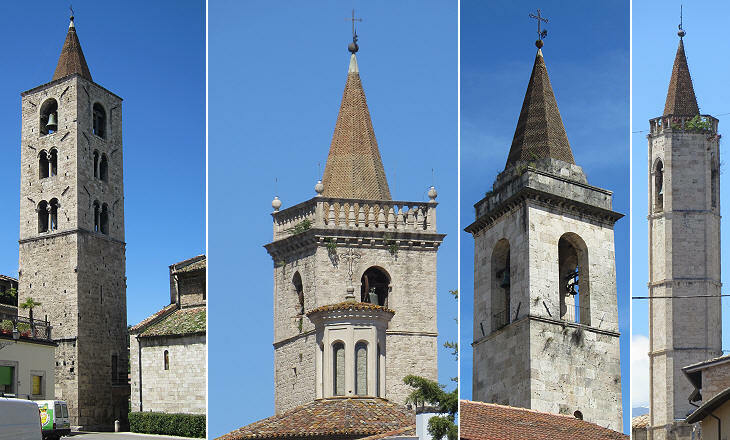 Ascoli has bell towers of different periods and styles, but almost all of them end with a spire. The two bell towers of S. Francesco (XVIth century) are of a rather unique pentagonal shape and are so tall in respect to their base that they resemble an Ottoman minaret.